The second film is shot in the original Jewish ghetto in Venice, where the word 'ghetto' is thought to have been derived from the Italian word ‘geto’, meaning foundry. The site in the Cannaregio sestieri (district) was originally the location of fourteen copper foundries. When an influx of Sephardic Jews joined the city’s existing Jewish population, the authorities responded by passing a decree in 1516 that restricted them to an island ghetto. Christian guards were posted at the gated bridges, which accessed the ghetto, and stringent restrictions were placed on the community. As the Jewish population grew, the pentagonal-shaped Ghetto Nuovo expanded into two adjoining areas: Ghetto Vecchio and Ghetto Nuovissimo. The gates were not removed until Napoleon Bonaparte occupied the city in 1797, after which the Jewish population, which obtained full citizenship in 1818, gradually dispersed throughout the city and to the mainland. Of the Jews who were deported from Venice during the Holocaust, only eight returned. The Campo Ghetto Nuovo, the main square, has two memorials to victims of the Holocaust. Today there are five synagogues remaining and the Venetian Jewish community consists of around 440 people. In recent years, the Hasidic community of Chabad Lubavitch have established a yeshiva, a community centre and a kosher restaurant in the quarter. 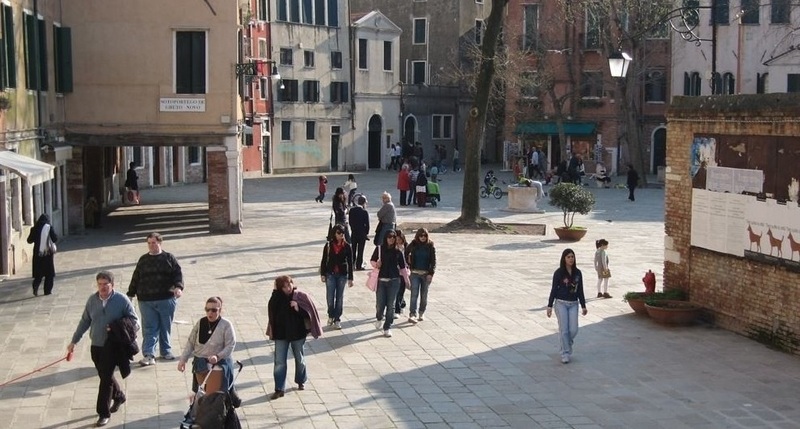 The film documents the shifting presence in the campo of the few Jewish occupants, the steady stream of tourists and school groups, and the large number of local non-Jewish residents from adjoining neighbourhoods who flock to the spacious square in the early evening.